What Clinical Readouts are Included in DILIsym? The primary clinical readouts of DILI include numerous biomarkers, many of which are included in DILIsym. DILIsym includes classic serum biomarkers such as alanine aminotransferase (ALT), aspartate aminotransferase (AST), bilirubin (total, conjugated, and unconjugated), and prothrombin time. DILIsym also incorporates emerging biomarkers of DILI such as HMGB1, cytokeratin 18 (K18), sorbitol dehydrogenase (SDH), Arginase-1 (Arg-1), and micro-RNA 122 (miR-122). DILIsym also includes many other critical model outputs that help assess the level of liver injury such as the fraction of viable hepatocytes, liver levels of adenosine triphosphate (ATP) and glutathione (GSH), and other various PK outputs. 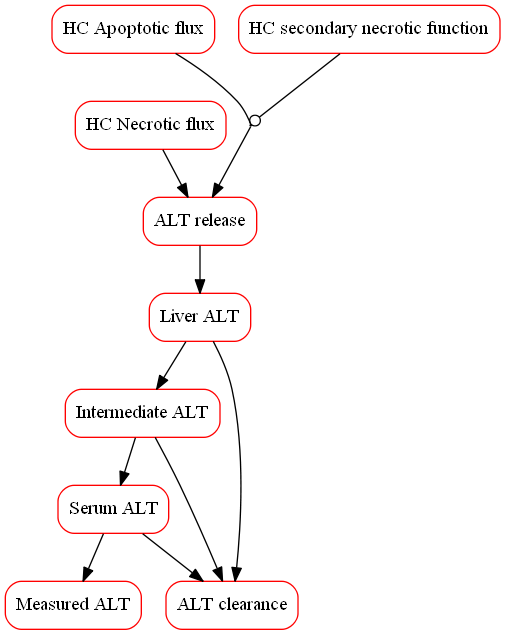 The fraction of viable hepatocytes, is computed over time and can be directly viewed as an output, reflecting net loss and regeneration of hepatocytes. 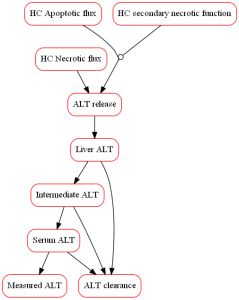 Due to the mechanistic nature of the underlying model, DILIsym can predict hepatocyte loss for a given ALT profile.